Flower Beauty can now be found in Canada! Sold exclusively at Wal-Mart, Flower Beauty is Drew Barrymore‘s cosmetic line. Drew’s philosophy is that department-store-quality beauty products should not cost you an arm and a leg, and Flower does this by forgoing any advertising costs. All products are made in the USA, and are not tested on animals. 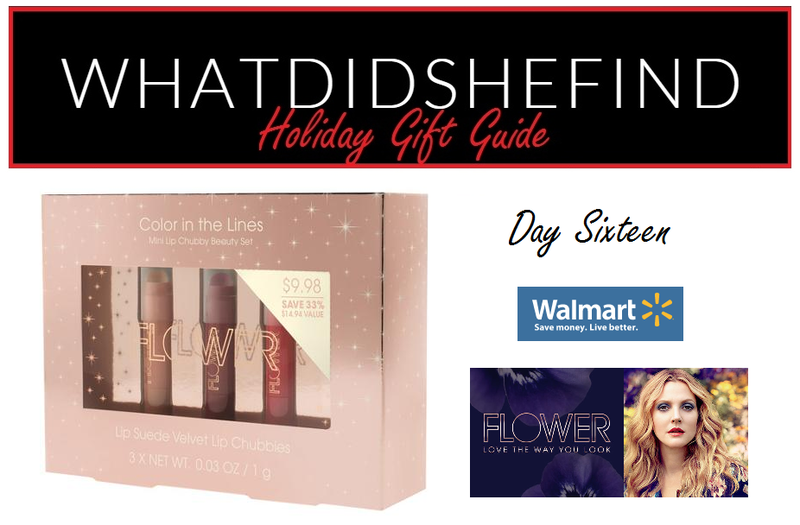 Today’s gift is their “Color in the Lines Mini Lip Chubby Beauty Set“, which comes with 3 of their most popular Lip Suede Velvet Lip Chubbies, and can be purchased at Wal-Mart in Canada for $9.00 (or $9.88 in the US). These lip chubbies have great colour payoff, are self-sharpening, and will fit perfectly in a purse or clutch. This set is a great way to introduce a friend (or yourself) to a cosmetic line that is sure to have great success in Canada. They’re also the perfect stocking stuffer!